Cancellation policy: we require 3 days cancellation notice prior to your scheduled arrival. Otherwise, we will charge you the first night. San Marcos Taganga provide a friendly, personal service as well as clean, comfortable rooms at wonderful prices. 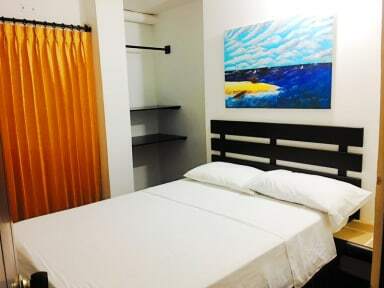 On the other hand, we offer free WiFi in every room, laundry services as well as a nice terrace with a beautiful ocean view where you can eat, drink and chat. Additionally, we will help you to plan your trips and excursions. Finally, this is not a party hostel, but we have a reception service for 24 hours so you can fully enjoy the nightlife of Taganga. San Marcos Taganga located a few meters from the beach, ending the bay, where you will find boat transport services so that you will have easy access to other beaches and perform activities such as diving and snorkeling. Additionally, you can also find a variety of restaurants with fresh seafood. Moreover, a five-minute walk will take you to the main bars and nightclubs. The stay at this hostel was so nice. 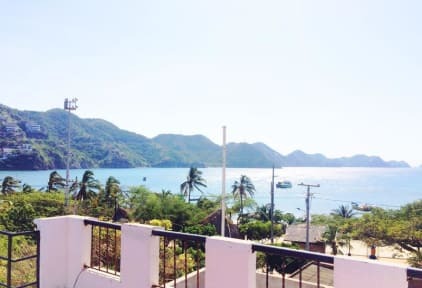 The beach and the main attractivities of Taganga are really close, the hostel is clean and has an awesome terrace with ocean view and hammocks. The breakfast is good and the staff really nice! Man kann jeden Tag zwischen verschieden leckeren Frühstücks Optionen wählen. Die Lage ist sehr gut, direkt an der Promenade. Preis Leistung deshalb top. Einziger negativer Punkt: bei uns fingen morgens um 6:00 Bauarbeiter an irgendwelche Klimaanlagen zu reparieren - Klar muss gemacht werden jedoch hätte man auch Rücksicht auf die Gäste nehmen müssen und die Arbeiter auf 9:00 oder so bestellen können. Super friendly staff, good location and nice breakfast options. The hammocks on the rooftop are a nice plus! Gutes Zimmer, klein aber fein. Aber:wenn Strom Ausfall (zwei mal in vier Tagen(:dann sehr warm und durch Generator sehr laut. Das Hostel war mit 17€ für ein 4-Bett Zimmer eines der teureren auf meiner Kolumbienreise und war mit Abstand das schlechteste. Kakerlaken, lieblose und dreckige Zimmer etc. inklusive. Scheint allerdings in Taganga eher der übliche Standard zu sein, wie ich durch ähnliche Erzählungen von Freuden erfahren habe. Don't go there and maybe don't go to Taganga. Wie die gute Bewertung des Hotels zustande kommen sind mir ein Rätsel. Respekt an den Fotografen für die durchaus ansprechenden Fotos hier!